Sharon Silverman's Crochet Blog — Sharon Silverman Crochet: Your source for 'How To' crochet books and fashionable patterns with clear instructions. Have you been caught up in the purging/organizing mania that’s sweeping (so to speak) the country? I’m all for it! Many of us have too much stuff, which makes it hard to know exactly what we do have and where to find it when we need it. I’m pretty tidy, and I like my environment uncluttered, but there is always room for improvement. Usually I’m motivated to reorganize a category or area when something frustrates me. For example, I have a few similar tablecloths and couldn’t tell what the dimensions were, which cloth would fit which table, and how many table leaves they would cover without unfolding them and trying them in place. Not very efficient. Recently I measured them all and pinned tags on with that information. Now I can find the right one easily. I don’t know why it took me so long to figure out such a simple solution, but better late than never. I did the semi-annual yarn purge recently (my stash goes to the Kennett Area Senior Center) and am very happy to have a few empty bins! Yesterday I was at Longwood Gardens. It’s their orchid festival, and the Conservatory is filled with orchids of every shape, size, and color. I particularly liked the display that looks like pansies at first but turned out to be mass quantities of orchids. The hanging baskets are also stunning. It was a chilly day but nice to walk around outside as well as in the warm Conservatory. When the weekend crowds are oohing and aahing indoors, the rest of Longwood is delightfully empty. I’m not currently working on a crochet pattern book, which gives me the opportunity to branch out a bit with my crafting. I hope to partner with some interior designers to create custom pieces for their clients. I’m starting by getting in touch with top local decorators, but I would certainly consider commissions from designers at other locations. I made a short (1:30) video to acquaint them with my work. All inquiries welcome! Big news: three of my classes were accepted by the Crochet Guild of America for the July Chain Link Conference in Manchester, NH. I’m thrilled! I’ll be teaching “Designing Crochet Patterns for Fun and Publication,” “Mosaic Crochet Magic, Including Cowl Pattern,” and “Lilytopia Shawl: Lightweight, Round, and Fabulous!” If things work out, I’ll also have the opportunity for a Delicate Crochet book-signing sometime during the conference. I’ll share the details with you as soon as I know them. Conference registration starts soon. You can find the details on the CGOA website. It’s the 25th anniversary celebration, which should be very special. I’m most excited about connecting with other designers and crocheters. I would love to meet you—let me know if you plan to attend. We are getting ready for some colder weather here in Pennsylvania, but nothing like the polar vortex descending up north. The forecast isn’t just for character-building cold but for dangerous, seriously frigid temperatures, the kind of cold that makes you feel like your eyelids are going to freeze shut and your teeth might crack. I hope all of who are affected by that stay safe and warm. If there were ever a time to have plenty of yarn on hand, this is it. I hope all of you had a good Thanksgiving! The holiday season begins for us when Longwood Gardens’ Christmas display opens. This year the theme in the Music Room is “books.” There are some incredible books with the ends of the pages folded in such a way to make words and pictures. What artistry! Truly inspiring. The wreaths and some of the poinsettias are also made of paper. Backing up a bit, our family was fortunate to spend two weeks in Italy in October. We stayed one week in Rome, with excursions to Pompeii and Monte Cassino, and one week in the Tuscan countryside from where we also explored Florence, Siena, San Gimignano, Montepulciano, and Lago Trasimeno. (I did pop into a yarn shop in Siena and of course forgot to take a picture!) It was the perfect balance of city and countryside, and museums and more active pursuits. We ate very well—it’s impossible not to in Italy!—and walked miles and miles every day. Speaking of teaching, I submitted some class proposals to be considered for the Crochet Guild of America conference next summer. They are supposed to report back the first week in January. I hope they say yes! Meanwhile, the exciting news is that DELICATE CROCHET HAS BEEN PUBLISHED! I wish this blog had smell-o-vision so you could inhale that sweet “new book” smell that greeted me when I opened the box of my author copies. The photos, the way the symbol diagrams and schematics look, the projects from the other contributors…I’m thrilled to see how the book came out! 12/9/18, 1:30-3 p.m., Luv2Knit&More, Jenkintown, PA.
On a totally unrelated topic, we have a lot of wildlife in this area. However, even for us it was a treat to spot a beaver in a pond in a Wilmington, DE park. We saw one a couple of years ago in the Brandywine at Hagley Museum, but this one was a surprise. It had made a huge lodge at the other end of the pond. A good reminder that winter is coming. Wishing you wonderful days enjoying brisk weather outdoors, and a place to come inside that’s snug and warm. A beaver at Talley-Day Park! The cover photo. A winner! The book, with 23 original patterns including written instructions and charts, came in at 176 pages. Besides my own designs, there are patterns from Kristin Omdahl, Vicky Chan, Karen McKenna, Vashti Braha, Rhonda Davis, Robyn Chachula, Amy Solovay, Katya Novikova, Jude Butterworth, and Marty Miller. With two Canadians and a Russian in that group, it truly is an international cast. I’m honored that the contributors agreed to be part of this project. Thanks also to photographers Daniel Shanken and Alan Wycheck, and the models who showed off the garments to stellar advantage: Alexis Lebo, Nina Magnani, Aron Rook, and Shay Strawser. Not to mention Candice Derr, Emily Cable, Caroline Stover, Tessa Sweigert, Judith Schnell, and Kristen Mellitt from Stackpole Books. For a sneak peek at the projects, click here. If you’re interested in purchasing a copy, you can do so here. Meanwhile, the Wall Hangings book from Leisure Arts is getting some good press. Here is today’s review courtesy of Ambassador Crochet. I really had fun designing and crochet those projects. You can see all of the designs here and purchase the book here. 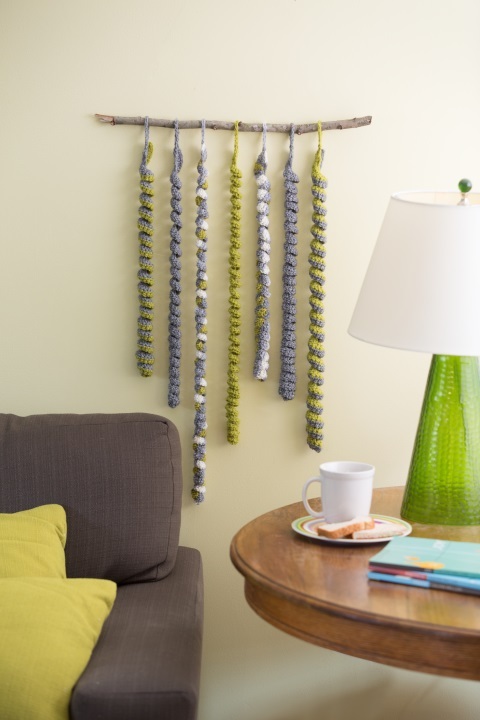 Add a little color to your decor! I’m really looking forward to a weekend in Virginia, teaching for the Crochet Guild of Prince William County. Four classes are on the schedule for November 10-11: Beaded Crochet, Tapestry Crochet and Basket, Crochet Patterns Demystified!, and More Techniques in Tunisian Crochet. If you’re in the area, the workshops are open to non-members as well. Here are registration details. The first week in December I have two Delicate Crochet book-signings and fashion shows set up (I’ll have all 23 items with me): Tuesday, December 4th, 7 p.m. at my home library, the West Chester Public Library in West Chester, PA, and Thursday, December 6th (don’t know the exact time yet) at the Lion Brand Yarn Studio in NYC! More information about both of those events will be coming early next month. I hope your autumn has gotten off to a warm and cozy start! A busy spring with new classes, new projects, and a new book coming! My February trip to Indiana to film two online classes for Annie's went great! The weather even cooperated and it was much warmer than when I was there two years ago. Both classes are live now, so I can reveal that they are "Tunisian Crochet: Beyond the Basics" and "Learn to Crochet Pineapples." Each class has two projects; here are some pictures. 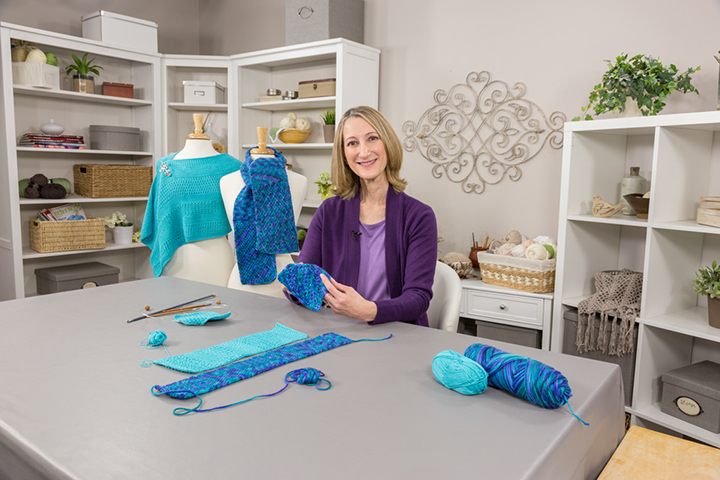 The projects for the Tunisian class are a two-texture scarf and a lacy shawl. The ones for the Pineapples class are a fringed lap blanket and a lacy half-circle shawl. As usual, the crew was terrific. It's amazing how many people are in the studio, all working to make sure the class is professional and polished. Three camera operators, the producer, director, editors, stylists...no wonder Annie's classes are such high quality. I was invited to one of my favorite yarn shops, The Knitter's Edge in Bethlehem, PA, to celebrate Local Yarn Store Day on April 21st. What a fun afternoon! The owners, JoAnne and her daughter Amanda, should be used as role models for any shop owner. Their store is spacious--with dedicated classrooms!--well-stocked with yarn for every budget, and staffed with knowledgeable, caring people. They set me up in their beautiful bay window to do a book-signing and some Tunisian crochet demos. I met all sorts of nice people who had come from nearby, and from as much as several hours away. (That goes to show you how valued The Knitter's Edge is.) One of the women I met that day has since invited me to teach two introductory Tunisian crochet classes at the Middletown Thrall Library in New York state in August. A lovely surprise to have that work out. I'm looking forward to my trip up there. Not sure if I will have time to visit Manitoga: The Russell Wright Design Center then, but I certainly hope so. I have been on the travel/architecture beat recently for The Hunt Magazine. My article about the National September 11 Memorial & Museum just came out in the summer edition; in the fall, features about Ladew Topiary Gardens and the Chicago Architecture Foundation River Cruise will be published; for winter, I'm covering Hollyhock House (a restored Frank Lloyd Wright site in Los Angeles) and Grounds for Sculpture in New Jersey. Manitoga would fit right in. I'm excited to report that Delicate Crochet is listed for sale! Check out the "Books" page and the "Sneak Peek" to see photos of the 23 projects included in the book, and the names of the designers who contributed patterns. Amazon has the publication date as 12/1 but it should actually be ready to ship in late October/early November. If you are going to TNNA or CGOA this summer, look for Stackpole Books and some of the designers showing off some sample garments. Videos, Books, and Travel Coming Up! Although it is still drab and grey outside, flowers are in full bloom indoors in Longwood's Conservatory. What an inspiring place! Right now it is their "Orchid Extravaganza." The variety of colors, shapes, and sizes of orchids is astonishing. It has been delightful to experience that (on weekdays--too crowded for my taste on weekends) and to return to work refreshed. The crochet book in the works for Stackpole Books is moving along. I made two trips to Harrisburg, PA to work with photographer Daniel Shanken on the model and studio shots. Together with Alan Wycheck's technique photos, I think the pictures in the book will be stunning! A Leisure Arts leaflet is ready for production as soon as one of the major craft stores gives the okay. I hope it's soon because I really enjoyed designing the projects for the book's theme, and I am eager to see them in print. I hope to do a fun promotion with Leisure Arts for National Craft Month in March. I'll share the details as soon as I have them. Next week I return to Berne, IN to film two crochet classes for Annie's. I enjoyed doing "Learn to Crochet Ripples" (and the pull-out class, "Go-To Ripple Tote") for them two years ago. The hardest part for me isn't the patterns or the scripts, it's the wardrobe! There are very specific requirements for what you can and cannot wear on camera. No black, no white. Red isn't so great either. No stripes or bold patterns, no texture that could "vibrate" on screen. Have to choose something seasonless. Nothing that is or looks handmade because then the students could get too interested in that and start asking for the pattern. Can't be too casual or too formal. Long sleeves are okay but they may not be pushed up. Fabric must be thick enough for the microphone to stay clipped on, and it can't make any noise. Have to wear a unique outfit for each class. I ended up with a bright blue long-sleeved crew under a watercolor sweater for one class, and a lilac top under a dark purple sweater for the other. Fortunately, I will be seated at a table so the pants don't matter! Last time the makeup artist was snowed out so I did my own makeup, but this time the hair and makeup person should be there to work her magic. I usually wear little or no makeup, but if I tried that on camera I'd probably look tired and washed out. I'm happy to put myself in the care of a professional. Look for some Instagram and FB pictures from the makeup chair next week! More videos will be on tap after that, but those will be done in my own studio for my YouTube channel. Subscribers keep signing up and they deserve some new content! If you have any requests for techniques to cover, please let me know. Plymouth Yarn Company has published several of my designs in the past. I love working with them! I noticed that one of the patterns I wrote for them is no longer available because the yarn has been discontinued. They were generous enough to turn back the rights to me and allow me to publish it with a different yarn. The result is the "Scarf de Triomphe Paris," in luscious SpaceCaded Maia. I'm expecting a "designer box" of samples to arrive from Plymouth soon, too. Can't wait to see their new products! I hope have been working on some interesting projects and are looking forward to spring! Feel free to share pictures on my Sharon Silverman Crochet Facebook page.